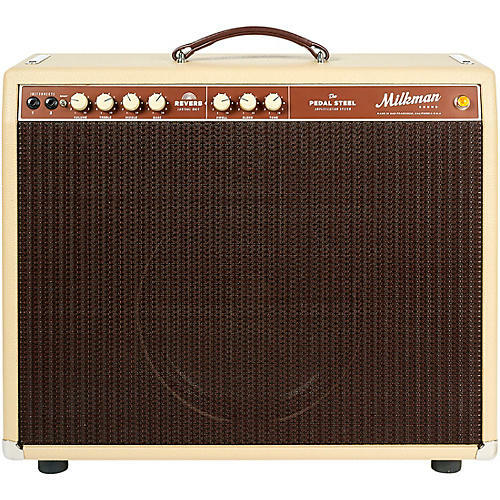 The Milkman 85W Amplifier is the flagship of the Milkman line. It has incredible headroom, feel and tone. Whether you are using it for steel guitar, or 6-string guitar, this amplifier is going to sing for you. Playing this amplifier is like fingerprinting with electricity. The responsiveness and clarity of your instrument will change the way you think about tone forever. It was originally designed for use with a pedal-steel guitar to capture the full bandwith of the steel guitar. As it so happens, the amplifier became very popular with 6-string guitar players as well. It turns out a great steel guitar amplifier makes an incredible guitar amplifier. The 85W is conservatively named. With a strong quad of 6L6 output tubes, this amp can easily knock out 115W. Your brain will go into distortion before the amplifier does. On top of the giant clean power supply and honey-sweet EQ section, there is a 3-knob tube reverb system. The added reverb controls allow for an enormous range of reverb sounds, and since the output of the amp is very clear and detailed, you can get into tone territory that is like an extension of your thoughts.